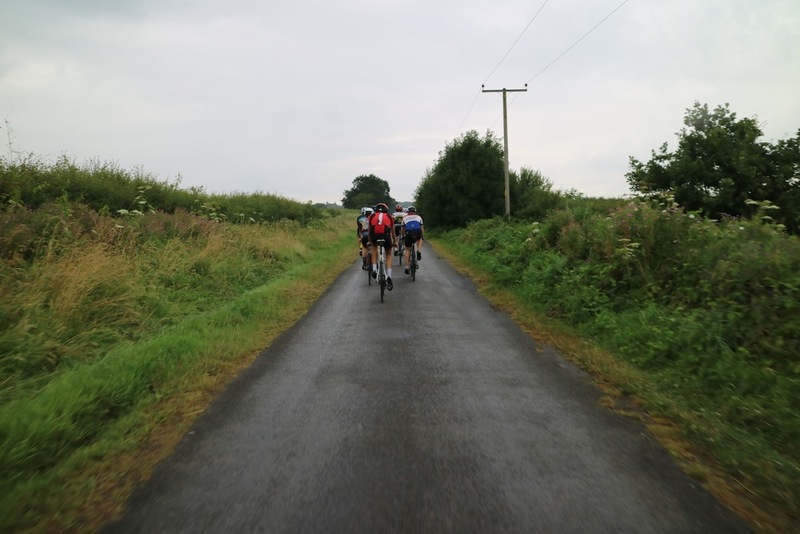 Shropshire Highlands Cycling Challenge 2015. In an age where everyone’s looking for a new challenge to add to their list and people place increasing levels of importance on experience, races (be they bike-based, running-oriented, obstacle-laden or some combination of all 3 and more) feel as though they have never been more popular. As a result, it’s often difficult to find one that isn’t over-subscribed, over-priced or sponsored to within an inch of its life. So when Luke sent me the link to the wonderfully lo-fi website of The Shropshire Highlands Cycling Challenge 2015, I was sold from the minute I saw it geocities-esque landing page. 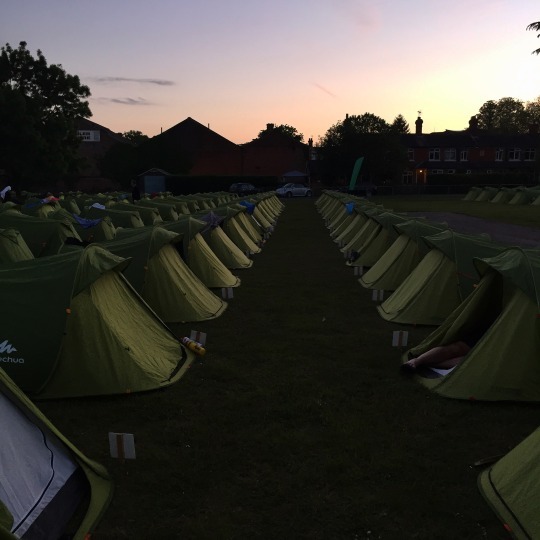 No tags, no numbers, no timing chips, no sign posts — for your £11.00 entry fee, you were sent a paper copy of the step-by-step directions for the course and had access to a Mr. Kipling cake and a cup of tea at each of your three rest stops. No Powerbars or energy gels in sight, and if you wanted a sandwich, you’d need to make sure you’d packed the extra change. After an evening of rain, we awoke to a dry and sunny morning. Porridge down, jersey pockets stuffed with tools and inner-tubes and bikes racked on the back of the car, we were on the start line for 08.00. It was there that I realised I had left my Garmin on the bedroom floor. It was time to fall back onto my iPhone and Strava. But there was a problem. I had next to no phone signal and, despite my best efforts to record, the app insisted on auto-pausing every 10 seconds. I spent the first 10km (and the first climb of the day) angrily thumping my screen, willing it to work. I realise all this technology-reliance flies in the spirit of the events off the grid approach, but with 10,000km to cover this year I very much subscribe to the Strava Prove It and Strava Or It Didn’t Happen credos. Sadly, with Strava’s signal dropping in and out, that was difficult to do. I’ll leave it there and concentrate on the ride itself after making one last point: my stats fell around 15km short and, somewhere in the hills of Shropshire, I lost 400m of climbing. I will claw them back. 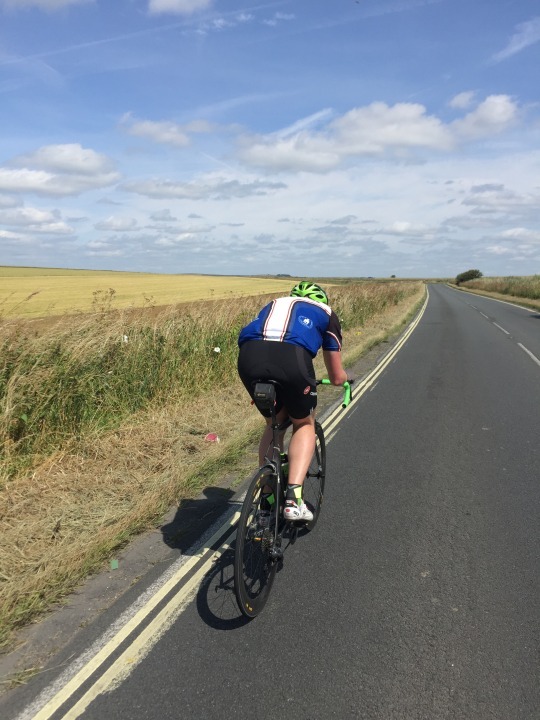 Having carried out numerous breathing exercises, I was able to restore my inner-calm and begin appreciating the unbelievable scenery being showcased at the top of the numerous climbs of the course. Sadly, I don’t know the actual name of one particular highlight, but as a local, Luke was able to tell me its moniker: Top of the World. At the top of this climb was some of the most exciting and unusual riding I’ve been able to experience this year. 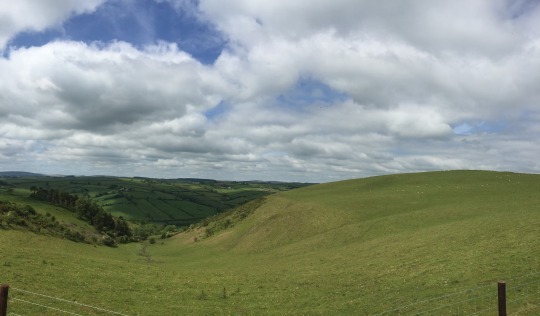 Surrounded by valleys and hills, the road before you morphs from compressed tarmac to loose gravel soon after reaching its top. Whilst the probability of experiencing at least one puncture increases exponentially, so too do the number of sheep and cows freely roaming the green grasses either side of our route. Eventually, the tranquility gives way to cattle grates (never a pleasant experience on the posterior or the forearms) and an incredibly hairy downhill section. Those were two of the major risks we were facing on the challenge: high likelihood of punctures on messy roads following heavy rain the day before and steep descents on unknown roads. The latter is always a recipe for potential disaster as confidence and excitement fuse to become arrogance and you find yourself misjudging the sharpness of the corner, the surface or the road or amount of oncoming traffic waiting for you on the other side. It’s never worth it and thankfully we didn’t fall prey to either. A risk I had not factored in, however, was wildlife and — more specifically — insects. 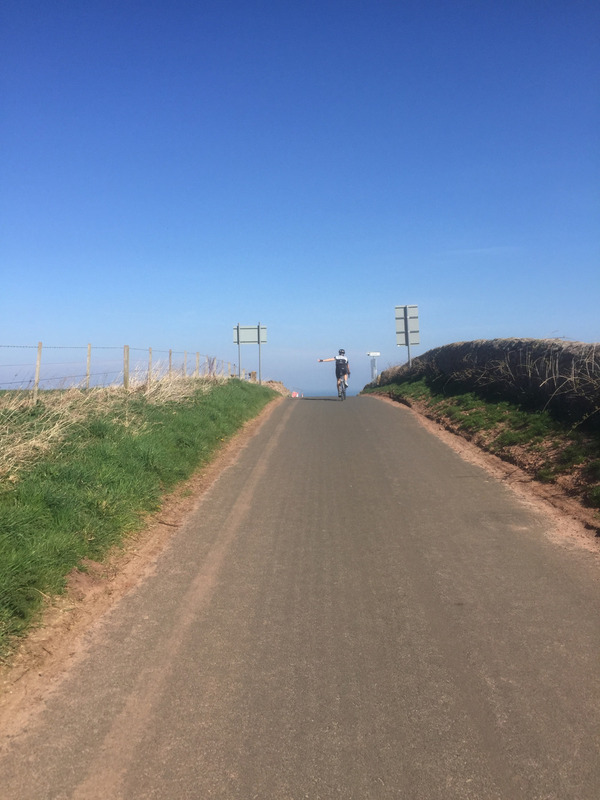 Somewhere between our short jaunt over the Welsh borders and back into England, an incredibly acrobatic wasp was able to work it’s way up, over and into my not-exactly-baggy lycra jersey. Feeling it buzzing away somewhere down near my left love-handle, I clawed at my jersey to waft my uninvited passenger back out into the world. It seemed to work. The buzzing subsided and I was able to focus on the next 5 miles to the final rest stop. Dismounting for my third instalment of the Mr. Kipling range (Viennese Whirl this time round, if you’re asking), the vibrations of wasp ricocheting between skin and lycra began again in earnest. Before I was able to panic-strip and indecently expose myself to a community hall filled with people, it had gone in for the kill and stung me. I watched as it half-heartedly flew towards a window, already on its last legs. On the subject of last legs, the last leg of the challenge brought with it the most challenging hill of the day. 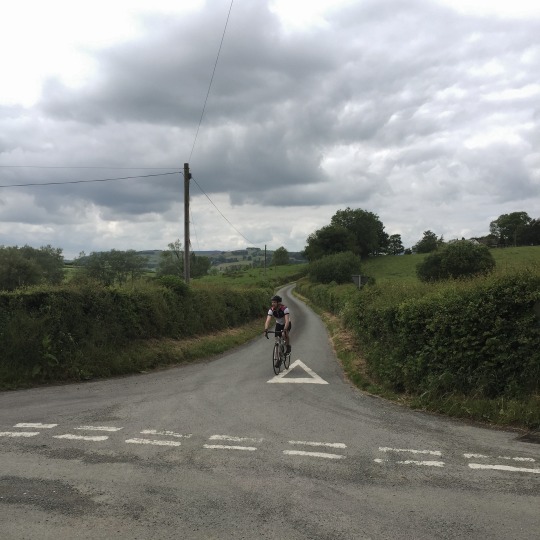 As a general rule, the last hill is always the most difficult regardless of gradient or categorisation purely because your legs are already storing everything from the kilometres that have come before it. Anything left should and will be left on that final upward stretch. In this case, I’m confident that this climb would have been considered the hardest of the day regardless of where it was placed. If you’re unwilling to take my word for it, I hope the name will convince you: Goat Hill. I do not know the etymology of the name, but having ridden up it I can take an educated as to how it came to be. Quickly running out of gears, any hopes of standing out of the saddle for a little more power were quickly stymied, with my back wheel beginning to spin freely as it lost traction with the road. Luke, borrowing his Dad’s bike for the ride, had forgone cleats for trainers and stirrup pedals. To have powered through on that set-up was impressive, especially as I watched more than one rider lose grip, then momentum and finally their balance on the sharper, steeper bends, forcing them to walk the remainder. The Mr. Kipling range sampled, hills conquered, two countries covered (just, but a border crossing is a border crossing — just Ireland left to go now) and rain, crashes and punctures avoided, we were greeted beneath Ludlow Castle with a medal and the promise of lasagne at the end of our short drive home. Oh and by the way, learn from Luke’s mistake: you won’t want to bring the extra change for that sandwich. They’re not so good. Mitie London Revolution | Day 1. I like an organised ride. There are downsides, the biggest one being that you have to go somewhat out of your way to do them. Sometimes it’s an early morning train. Others, a car journey. In this case, it was a 25km ride to the start line. 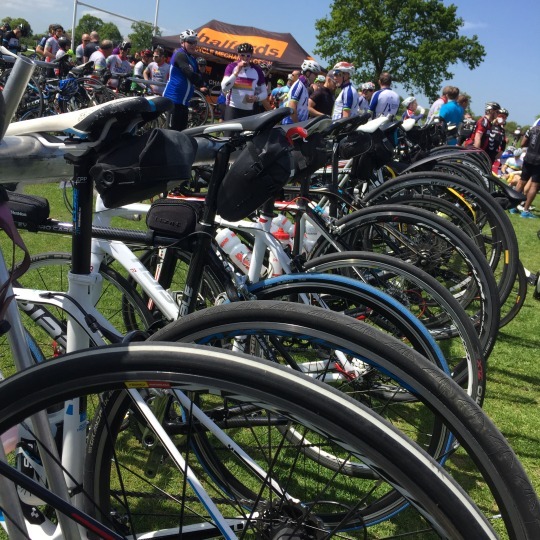 However, the loss of the convenience of starting and finishing a ride outside your front door are more than counteracted by what an organised ride has to offer. Route planning is non-existent. 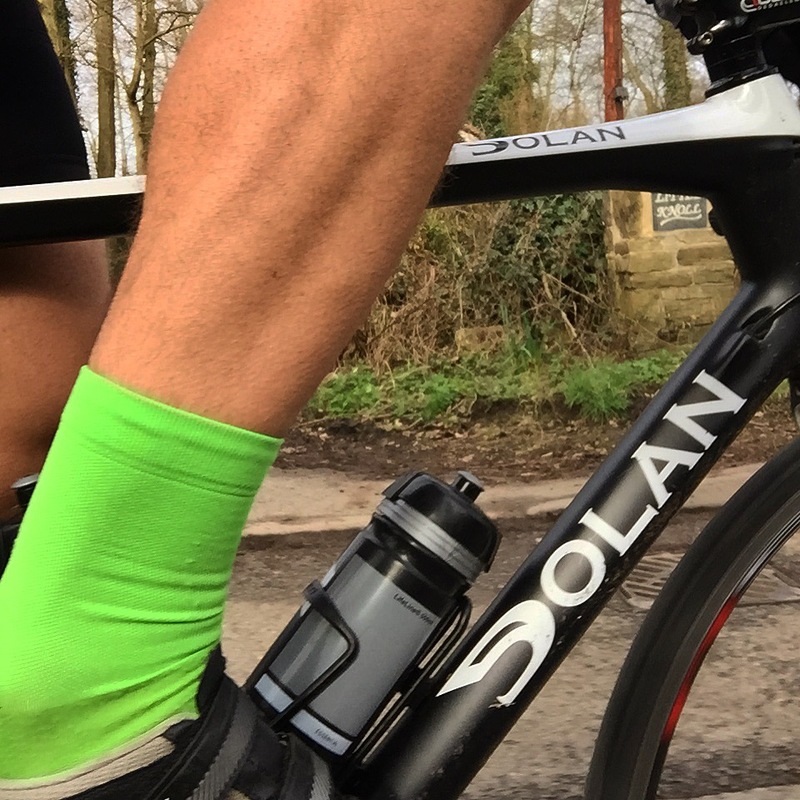 Stem-staring is no longer necessary as you replace the reliance on an iPhone or Garmin with following the peloton or, better yet, the well-placed and frequent road signs. 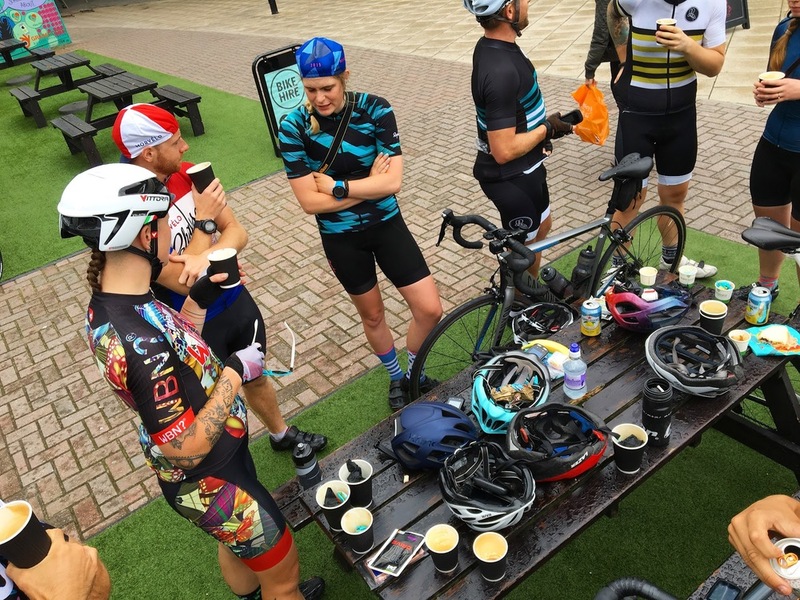 Snacks are packed on an emergency-only basis, with fuel stations fulfilling all cake and coffee doping needs. In short, the majority of thought is removed, leaving the joy of the ride and an unexplored route to be enjoyed. The initial 25km I mention was to take me out to Lee Valley for registration. On my way out, I picked up my ride partner for the weekend, Saul. 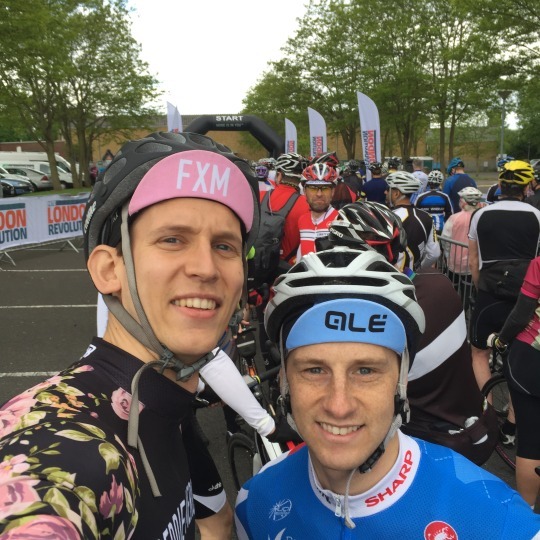 Together we’d be taking on the Mitie London Revolution, a two-day sportive that would take us around the edges of London. However, to get to the outskirts and suburbs of Greater London, we first had to work our way through its centre. 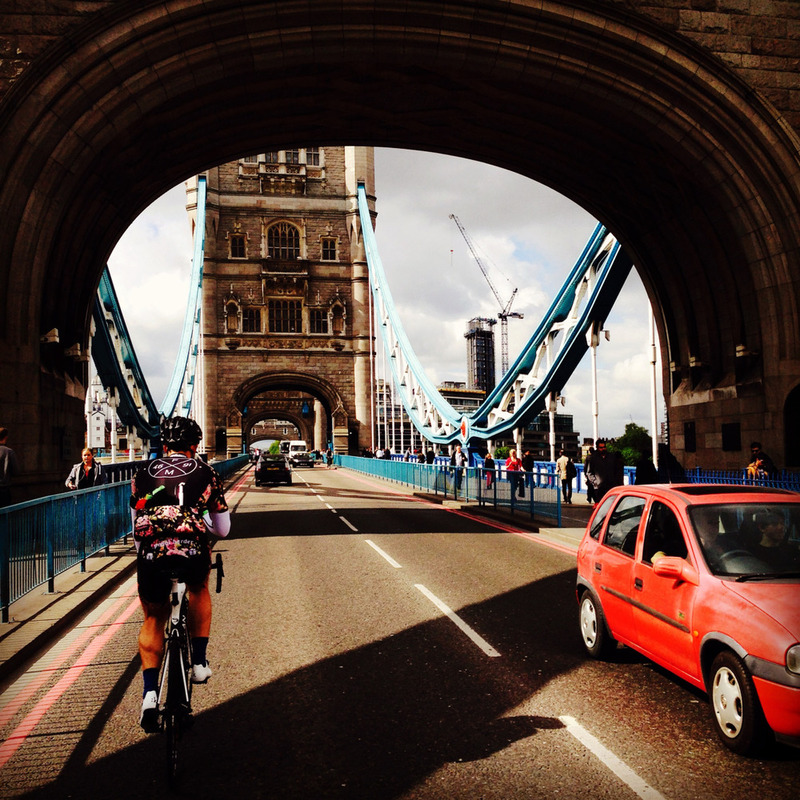 Following a route very similar to the one that had got me to the start line, hundreds of riders moved their way through East London and over Tower Bridge. It was as slow-going as you’d expect given the mid-morning congestion and the number of traffic lights, but any sense of frustration was subdued by the meditative sounds of the peloton: the whirring noise of the freewheel, the click-click of tens of riders unclipping in unison, as they paused at yet another red light. The momentum began to build as we moved south from Crystal Palace and the group began to thin as everyone found themselves enough road to spread out. Sadly, we were reminded of the dangers of riding unfamiliar routes very early on. As we approached the top of a steep descent, we became part of a bottle neck at least one hundred riders deep. From what we were able to make out, a rider had taken on the narrow, slightly bumpy, tree-lined (and therefore dimly lit) hill too fast and not been able to manoeuvre through a blind bend. Whether or not an oncoming car was involved, I don’t know, but the road was certainly open to two-way traffic. 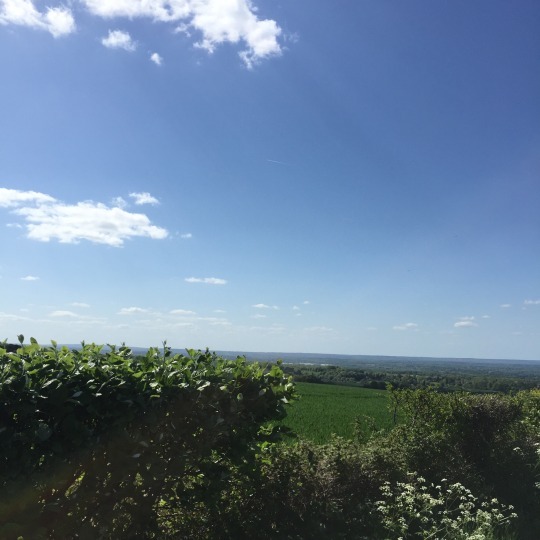 When we were given the all-clear to walk our bikes down the hill, the presence of an air ambulance in a nearby field sent a shiver down my spine and offered a tangible warning that is better to finish slow and safe than to not finish at all. Lightening the mood — and providing some light relief for our legs — were two rest stops along the way. The first was in Edenbridge, around 100km in. In terms of fuel, we were not left wanting. With a smorgasbord of chocolate bars, flapjacks, fruit, energy gels, energy drinks, biscuits, sweets, biscuits and cakes on offer, the danger wasn’t that we’d wind-up bonking somewhere between the start and the finish, but that we’d get overexcited and end up over-indluging. 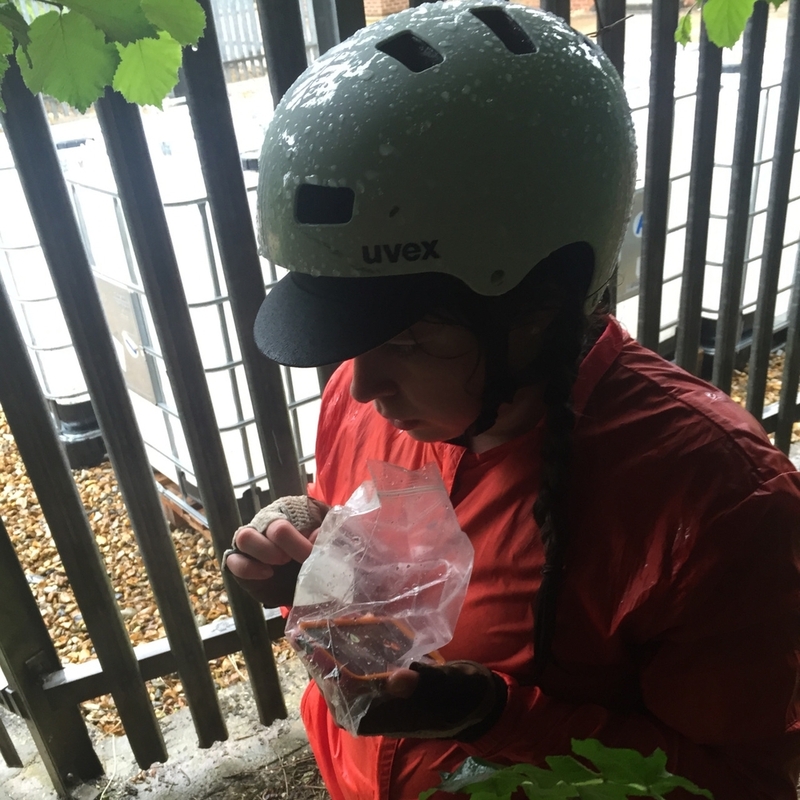 This became an even greater risk at the feed station, as sandwiches and a pretty decent cup of coffee (provided by Claud the Butler) were added to the equation. Exercising serious levels of self-restraint in both circumstances, I took a spot on the grass and, basking in the afternoon sun, made my way through my mini haul. The lethargy had perhaps started to take hold slightly as we left the second feed station. Within the first 10km, Saul let himself drift a little too far into my slipstream and was quickly thrown out of it and from his bike. His front wheel had skimmed against my back one and, unable to rectify the imbalance, he slid along the road at a not inconsiderable speed. Back on his feet, he’d picked up some nasty road rash, but everything was still bending and all of the cyclists riding behind him had managed to swerve around him. Thankfully there’d been no oncoming traffic, as he’d made his way onto the opposite side of the road. The bike was looking good, too, so he was able to brush himself off remarkably quickly, getting back into the saddle and powering on within a couple of minutes of hitting the deck. The final 50km towards Ascot put forth some of the best riding of the day. The sun had been shining all day, the roads were smooth and wide and the hills were negative rather positive, meaning the kilometres drifted away beneath our wheels. 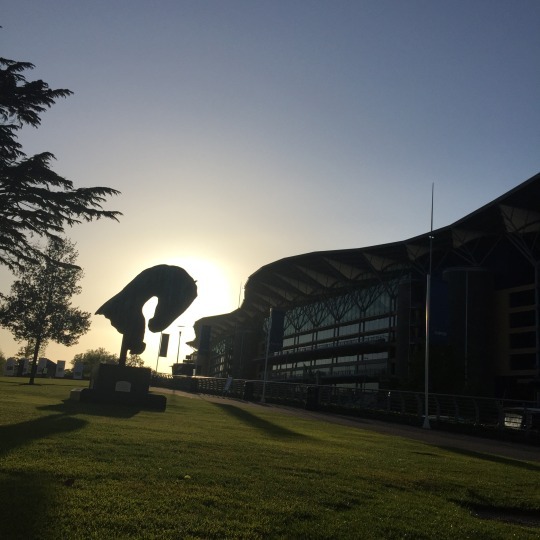 Arriving at our overnight rest stop — the racecourse itself — I felt tired, but capable of going further. It was a good sign, as this was my longest ride to-date and, knowing what lies ahead of me in September, these kinds of distances need to feel both familiar and achievable. Awaiting us were already-pitched tents, hot showers, massages and stretching sessions, plus a seemingly endless supply of buffet food. Two main courses, two desserts and two beers was all it took to make our eyes feel heavy. Sun down meant heads down and we were into our sleeping bags before 22.00 ready for an early start the following day. A new lease of life. As my birthday rolled around, I looked sympathetically at my 1980s Raleigh Sirocco. A year of commuting had not been kind to an already tired but always-reliable run around. 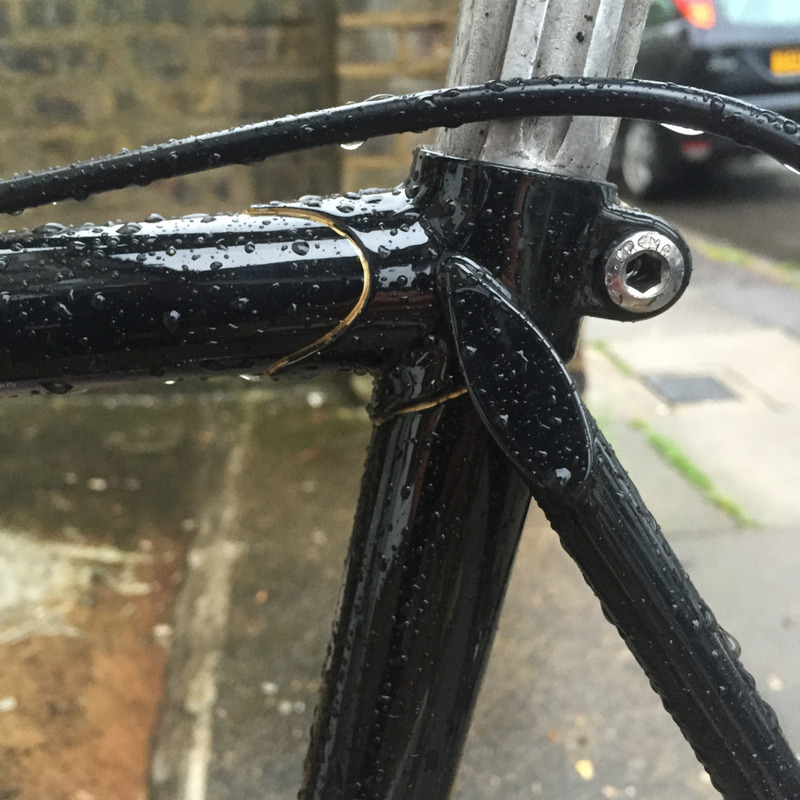 The handle bar tape sagged sadly from the bars as it continued to peel away. The paintwork was discolouring where Sharpie pens just were;t doing the job anymore. I worried for my own safety as I slammed on the brakes and finding myself stopping somewhere in the region of 15 metres later. Overall, it was looking forlorn and, growing tired of braking with my feet against the concrete rather than with my hands, I decided it was time to breathe some new life into the trusty workhorse. I picked up the new, improved Sirocco on the day of my birthday itself from the excellent ream at Seabass Cycles. They’d gone to town, stripping the bike back to its bare-bones and building it back up: new gears, new brakes, new cables, new chain, new bar tape, new saddle. In fact, the only thing that remained was the original frame, and even that had been made to look like new with a black paint job finished with gold accents around the lug work. The wheels had also been held onto, although I was told they’d likely have to be replaced in the next two to three months as they were on their last legs. 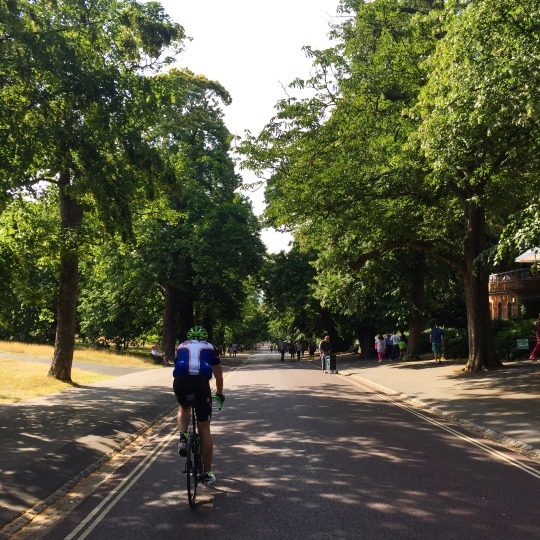 The very next day, I took my Dad with me on a ride to wear-in my new saddle and introduce him to the highs and lows of Londons cycling scene. We set out early on a Bank Holiday Monday to avoid onslaughts of traffic as we headed to Richmond Par. With a couple of laps under our belts – and Dad suitably impressed with the green, deer-laden haven surreptitiously tucked inside London – we began the journey home. By then, the traffic had picked up and I could tell it was a bit more of a nerve-wracking experience for him. He wasn’t put-out by it, just a little unused to the constant nature of it. By the time we reached Vauxhall roundabout, I could see he was starting to get tired and the thought of contending with three lanes of traffic didn’t seem sensible. I therefore opted to get us onto the pavement and across via the pedestrian crossings. In a moment of either lack of concentration or complacency, he found himself unable to unclip from his pedal and, panicking slightly, fell in slow motion into me and my bike. I managed to stay standing and, once we’d made sure Dad was okay (he was – we’d hardly been moving at all), we checked the bikes. I pressed the brakes. All good. Span the front while. Straight and narrow. Tried to spin the back wheel again. It didn’t want to budge. The weight of my Dad had buckled the wheel leaving the bike almost un-cyclable. I emphasise the word almost, as I was able to ride the final 7km back to the house with the wheel snaking precariously behind me before getting it back to Seabass for the replacement wheels a little easier than I’d anticipated. The Stag | Day 2. The second day started early, at around 6am. The sun was still rising over the hills of the surrounding valley and the mist and frost had yet to dissipate from the impending heat of the day. Looking out at the view from the bedroom window, it was nothing short of beautiful and completely chased away any weariness that ran the risk of creeping in. It also made for a picturesque backdrop on which to share our breakfast: half a CLIF bar and a cup of tea. Our first rest stops opening time was what dictated our departure. The 130km route we were taking had us away from any form of town or village for tens of kilometres at a time. Running light on any form of snacks, we had little room for unplanned breaks and therefore slowly packed and got ourselves on the road for a little before half past seven. Once again, the wind was behind us and, it still being early, there was little traffic on the road. Little soon became none as we left the A and B roads behind and planted ourselves on country lanes for what would be the majority of the day. Our pre-breakfast route was an excellent warm-up for the day, with nothing but relatively flat roads interspersed with a few small hills to break us in. We wheeled into Dunns and spotted the sign of our haggis roll purveyor. I’m not sure what it is about small villages, but there seems to be a real affinity for cafes located in garden centres. This isn’t the first time I’ve experienced these dual-purpose businesses on cycles, but this was definitely the friendliest encounter so far. Wheeling our bikes past the piled-up bags of compost and through the stacked lines of plant pots, all of the staff greeted us warmly, despite having only opened their doors minutes earlier and no doubt still comprehending the prospect of another day of work. I’d imagine the somewhat novel sight of two dishevelled men in skin-tight clothing contributed to their smiles. The glorious sunshine probably helped, too. The only irk from anyone came as the result of Gorrods order: “A haggis and egg roll? Well I’ve never heard that before”. Given the limited range of breakfast accoutrements in existence – bacon, sausage, egg, beans, tomatoes – we were somewhat surprised that any pairing with haggis would come as a curveball. These guys either lacked a creative intrigue, or Gorrod really had strayed far from the Scottish breakfast track. Regardless, we’d only been in Scotland a few hours and he’d already rubbed the locals up the wrong way. We were right about there not being anything beyond our first rest stop. I’ve never been on a ride that doesn’t pass the odd local shop, newsagent, cafe or pub every 10km or so. I suppose that’s the result of the majority of my rides taking place in and around the M25. In this case, though, the 50km that followed saw more farmhouses than public houses; more road kill than cars. The roads themselves had begun to slope upwards considerably, with hills being more of a level you’d expect from a day with circa. 1,700m of climbing. It was the kind of climbing that I enjoy, with short, sharp bursts of uphill that for the most part, allowing you to attack before resting your legs on the freewheel provided by the descent. Yes, at times it meant struggling skywards at 15kph for several minutes, but for every 5 minutes of that, you benefitted from 10 minutes of sailing through Scotland’s quiet roads at 50kph. Civilisation was reestablished at 95km in the town of Haddington and with it, we encountered our first set of traffic lights since Kings Cross. 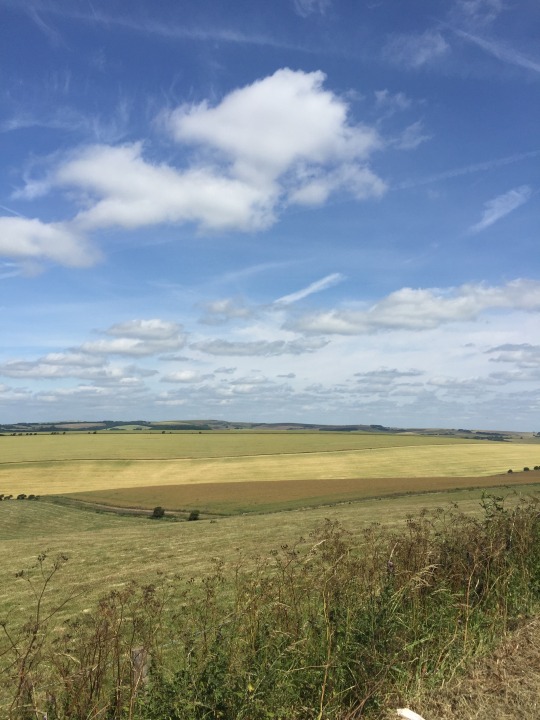 You quickly forget the existence of such things on getting out into the countryside, meaning you don’t appreciate their absence until you find yourself slowly approaching one, willing it to go green before you need to un-clip. Coffees consumed, our final 35km was back towards the coast of the fairly aptly named Musselburgh. Whilst the name suggests a rustic, coastal town, home to shellfish, fishermen and trawlers, I can assure you that it was more akin to a tired British seaside town (although the internet informs me that, as one of Scotlands oldest towns, it’s known for both its golf course and its racecourse). 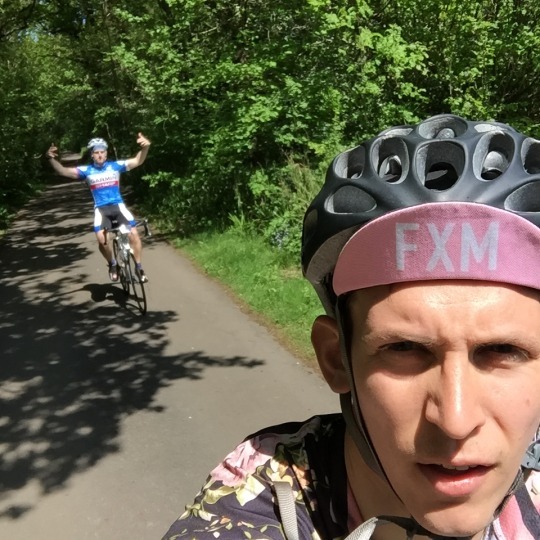 On our approach to Edinburgh, we were both determined to hit the all-important Gran Fondo distance of 130km, but soon realised we were running out of road. The city centre was fast-approaching and we still had some ground to cover before it was official (to both us and to the Strava app, which would be officiating). I wasn’t helped by my GPS dropping off in a tunnel, costing me several hundred metres. An extra lap of the town centre was needed to take us over the line. We jokingly referred to it as our victory lap, moments before Gorrod – choosing to ignore the designated cycle lanes and keep to the roads of Edinburgh – discovered a still fairly new addition to the city: its tramlines. Both of his wheels locked in to the thin metal grate, leaving him with no room for manoeuvre. With little option other than to hit the tarmac, I watched as he slid down our final descent, closely followed by his bike. 100m from the finish and we had our first casualty. Dragging his bike, and himself, over to the pavement he should have been riding on originally, we assessed the damage. The bike was fine, with no damage to the wheels or frame. The important information established, we then turned to Gorrod, who had succumb to a little road rash and a hard knock to the hip, but little else. Thankfully, we were more than capable of free-wheeling to the finish and Gorrod was still more than able to participate in a weekend of Stag-based activities. 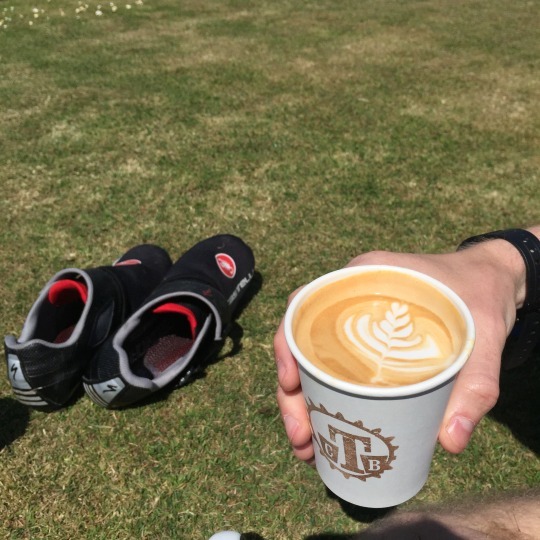 My total distance flicked over to 130km seconds before I unclipped at our final stop, Fortitude Coffee, where we both toasted an almost-successful morning of riding over a cup of delicious coffee and a couple of shared slices of cake. As we did, I synced my ride data from Garmin to Strava and was horrified (and I’m somewhat shamed to admit that this is not an understatement) to discover I had in fact logged 129.9km. That equates to around 5 seconds of riding. That tunnel had cost me dear. Gorrod laughed (too much, if you ask me. He seemed to be taking some level of enjoyment from it). 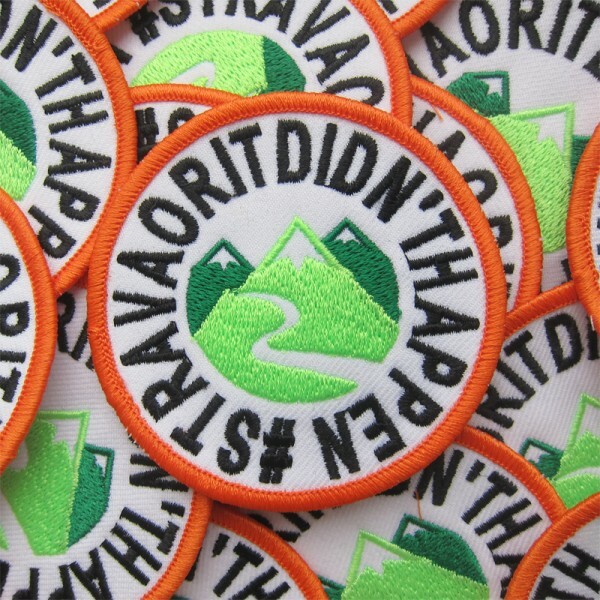 I began drafting my email to Strava in a vain attempt to reclaim those much-needed metres (and you’ll see the retrospectively resolved the issue). Questionable distance measurement aside, we had made it to the city centre exactly on schedule. We’d crossed borders and taken in some incredible scenery. We’d also put in a solid couple of days of base-tanning our perma-kit lines for the summer. We were ready to begin The Stag proper. Too many late night after late night. A few too many beers the night before. A restless nights sleep. 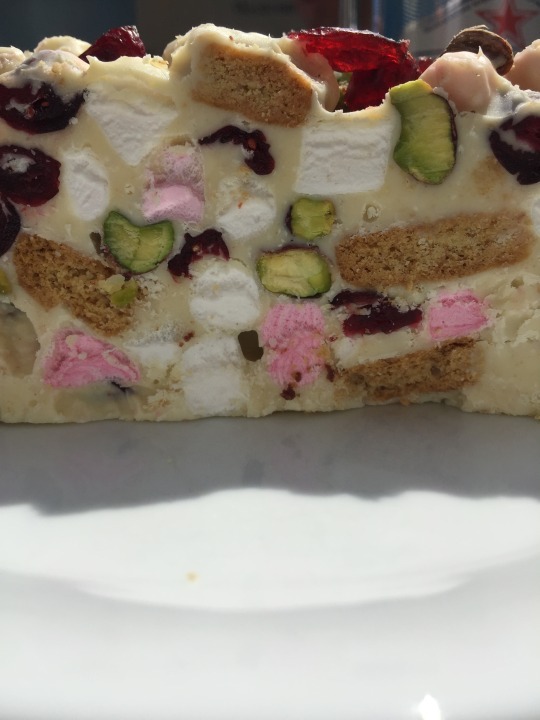 Eating the wrong thing before jumping on the bike (or simply not eating enough). Thankfully, it didn’t happen to me. At least, not this time. 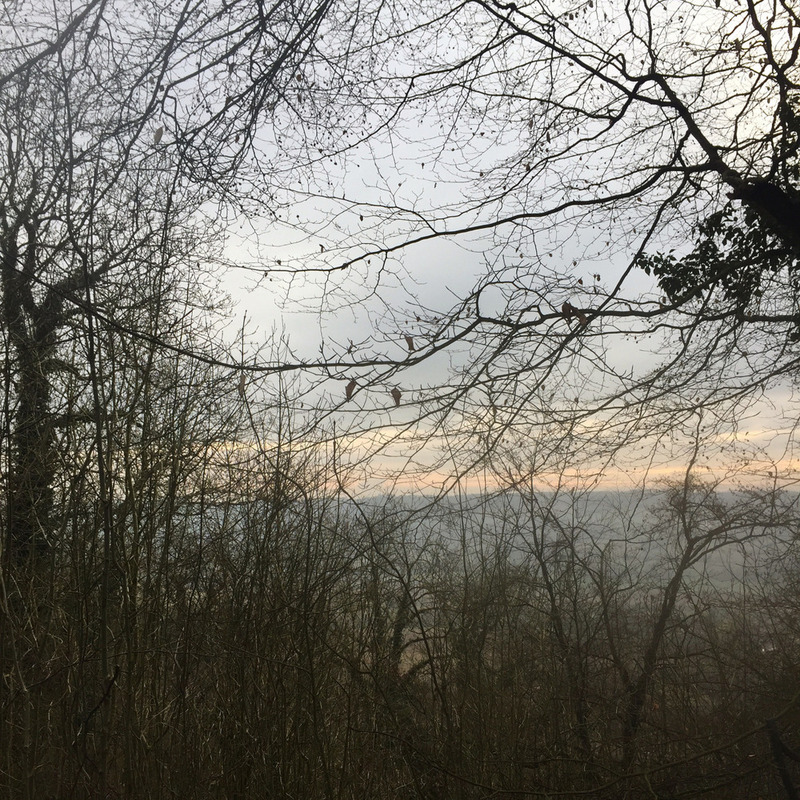 Joining me on an early Sunday morning jaunt to Royal Tunbridge Wells and back, Gorrod had a week of long, stressful, physically-involved days in him thanks to his recent house move. Ever-eager — and almost always running behind time — he wound up feeling the need to cover the 15km from his new house to mine in under half an hour, leaving him slightly out of breath and, as we’d discover, on the back foot before we’d even begun. In hindsight, the tell-tale signs were there by the time we’d hit 40km. Whereas he would normally always place himself half a wheel ahead of me (a physical embodiment of his superior fitness), today Gorrod was, at best, alongside me. His head hung heavier, too, looming towards his handlebars. I quietly rejoiced in the fact that I didn’t have to worry about getting caught in the friendly fire of his snot rockets. I also began to congratulate myself on what was clearly a considerable improvement in my fitness levels. Any misplaced confidence was immediately shattered when Gorrod pulled into the side of the road and began devouring a CLIF Bar. We were 3km from our rest stop and he is a proud man — as much as I wanted it to be the case, he didn’t just fancy a snack. 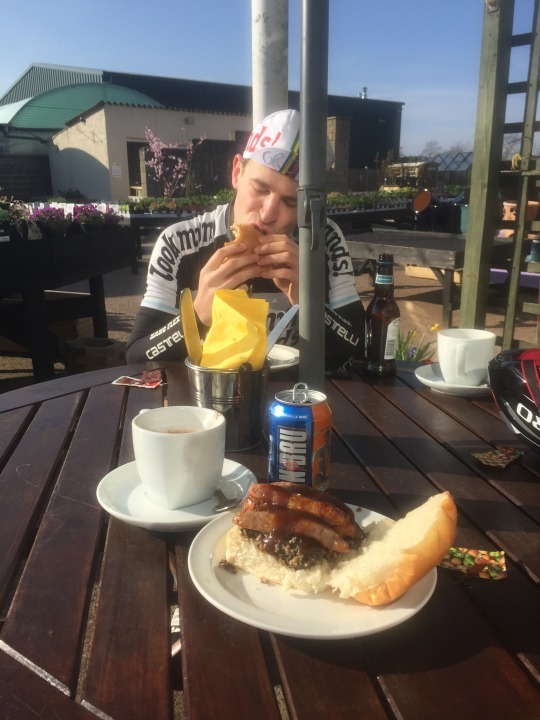 Not even a considerable breakfast at The Velo House could reinvigorate those tired legs to regular service. As we rolled past train stations, I watched as he surveyed them with intent, actively weighing up the possibility of dismounting and switching to an infinitely easier mode of transport. 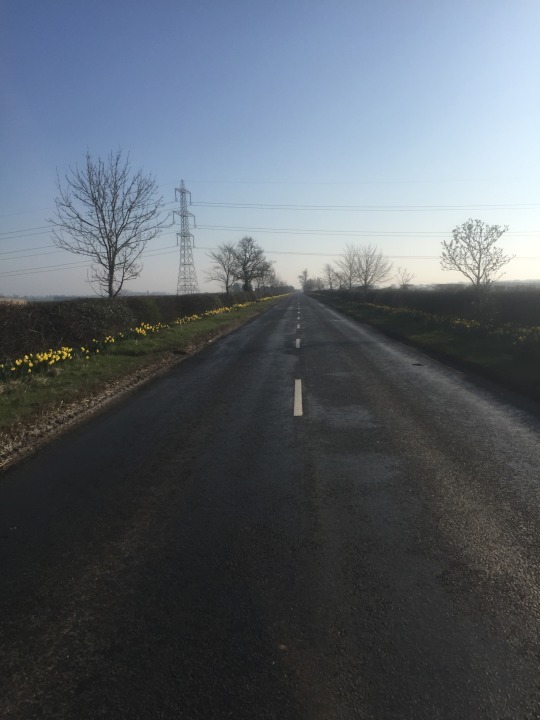 Having already tackled these roads within the last month, involuntarily becoming the stronger rider made them feel somehow easier. 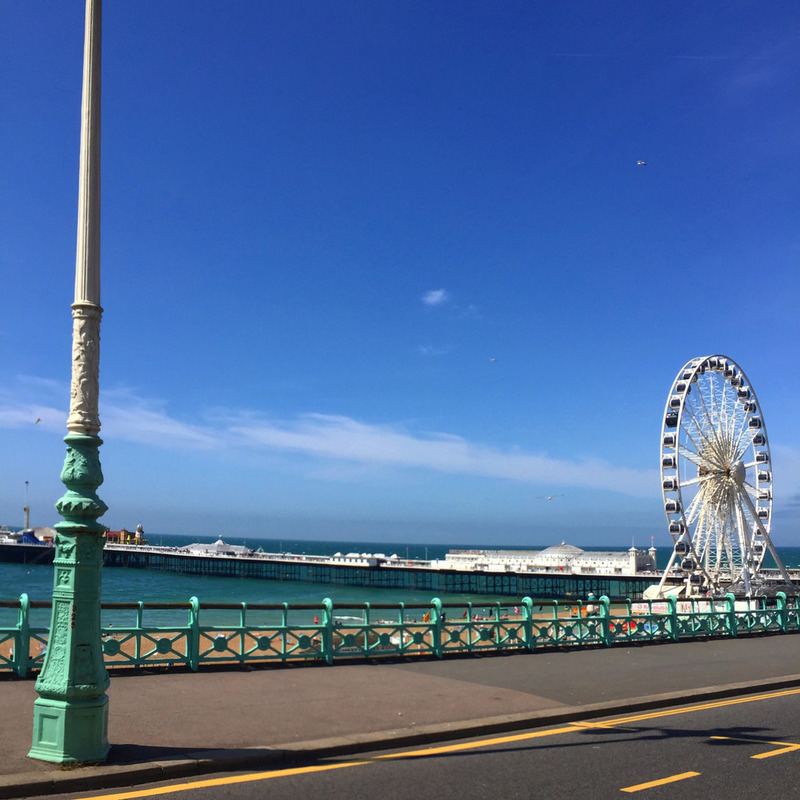 My focus was drawn away from the inclines and towards making sure we both made it up and over together, which meant having to take on a level of positivity I rarely afford myself. Gorrod crossed the 3-figure threshold somewhere on the way back in to Bromley. It was either that, his breakfast kicking-in or the possibility of the ride being over becoming very real that brought him out of the other side. As I say, rather him than me, but I know that it’s only a matter of time. All of this said, I do feel it’s only fair I point out that bonking doesn’t mean Gorrod crawls along at a snails pace. He managed to average a speed of 26kph over the course of the ride. It’s little wonder I struggle to keep up on the good days. I’ve alluded to it already, but whenever I possibly can, I choose to get around on my bike. Living in London, that’s not uncommon as the alternative tends to be a crowded train, tube or – if you’re feeling rich on time – bus. For me, starting my working day (or any other day, for that matter) on public transport has a visibly negative impact on how it tends to pan out, with my journey heavily influenced by my mood and frame of mind. To be clear, this isn’t a dig at TFL or London transport at large. I happen to think it’s an excellent service (for the most part – I have witnessed and experienced London Bridge Station in the past few weeks). I just take an inordinate amount of joy from getting around on my own steam, choosing when’s best to leave, how best to get where I’m going and being confident in how long it will take me to arrive there. There’s also a small part of me that relishes the saving I make on tube fares. It’s pretty measly on a day-to-day level, but knowing I’ve saved upwards of £30.00 on a weekly travelcard tends to offset any guilt I might feel for ordering a big lunch or extra coffee when I’m out on a ride. 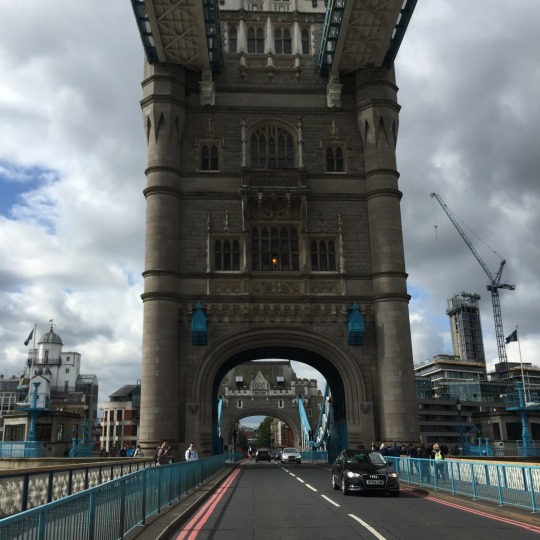 Not only are my almost-always-daily commutes helping me eat away at the 10,000km goal, but they’re also allowing me to see London as the ever-changing place that it is. Admittedly, there are some days I get soaked through, cut-up, beeped at and even the occasional middle finger. But for every bad ride, there are infinitely more new, exciting, interesting or just plan fortuitous things that tip the scales back in my favour: a building, object or structure that catches my eye for the first time; the sun coming up behind The Shard, Tower Bridge or a dilapidated, disused water tower; a serendipitous conversation with a stranger at a set of traffic lights (and, a little less frequently, someone you know); a tail wind on the home straight that gets me through the front door 30 seconds earlier. Some of these moments are feelings and some of them are sights. However, for me, they are what cycling is about. They’re the reason I take (almost) as much enjoyment from forcing a clapped-out, old 1980s banger of a bike through the worst of what Londons roads have to offer as I do from gliding a carbon frame through the smooth and winding roads of Surrey. It’s these moments I’m hoping to capture more and more of.